An adolescent girl may write poetry, so long as it is securely locked up in her pink leatherette five-year diary. Suburban professionals are permitted to enter jolly pastiche competitions in the Spectator and New Statesman. At a pinch, a young man may be allowed to write a verse or two of dirty doggerel and leave it on a post-it note stuck to the fridge when he has forgotten to buy a valentine card. But that’s it. Any more forays into the world of Poesy and you release the beast that lurks with every British breast—and the name of the beast is Embarrassment. Fry, believing that poetry can be a fun way to play with language, wants to give aspiring poetic hobbyists what other hobbyists have in abundance—a guide to improve their play. The point, says Fry, is to have fun, whatever you choose to wax poetic about. Fry’s goal is to give potential poets familiarity with poetic tools and techniques and some practice using them. And he does so in a way that is both fun and informative (even if it didn’t make me into the next John Donne or Gerard Manley Hopkins). Each chapter touches on a different poetic technique or form. Fry covers meter, rhyme, form, and diction. The chapters are filled with examples of Fry’s own verse as well as the verse of great poets from the past and present. And the book also includes 20 exercises in which readers are asked to mark poetic meters, make lists of rhymes, and more than anything else, write poems. Assignments include writing lines of iambic pentameter on uncompleted chores that are niggling at you, dactylic pentameter on cows, and a ballad about a man whose wife sucked out his eyes. This is, as you can imagine, a book that takes a lot of time. I’ve been reading it and working through the exercises off and on for several months. But the thing that I enjoyed about it is that the time doesn’t ever feel like work. Fry emphasizes over and over that poetry writing should be fun, and the exercises are not meant to require poetic brilliance but to give poets a chance to try out poetic tools and forms. It’s practice and it’s play. But if the old fascist was right in determining that his generation needed to get away from the heavy manner and glutinous clichés of Victorian verse, its archaic words and reflex tricks of poetical language, and all out-dated modes of expression and thought in order to free itself for a new century, is it not equally true that we need to escape from the dreary, self-indulgent, randomly lineated drivel that today passes for poetry for precisely the same reason? After a hundred years of free verse and Open Field poetry the condition of English-language poetics is every bit as tattered and tired as that which Pound and his contemporaries inherited. As the section goes on, Fry gets crosser—and funnier. There’s nothing like a good rant from an intelligent, witty person whom you happen to agree with. (I’ve made similar arguments regarding the rules of grammar, even as I adore the writing of some authors who break them.) Fry, incidentally, does not dislike all free verse; he just despises the presumption that free verse is superior to a good villanelle or sonnet. “Whichever style you use, use it well” seems to be his motto—with the understanding that learning the forms will give a poet more options. A quatrain can seem like poetic cliché. The rhymes are predictable, too. They go back and forth in the usual way. Freshness is the challenge for you. must play with enjambment as well as with rhyme. so I stop! I think! I try changing the time. if I don’t make an effort to vary. and make this poor verse just a little more merry. So as you can see from my sad little example, this book won’t necessarily make you the next Emily Dickinson or Langston Hughes. But it can help you have a little fun with language. For Fry, that should be good enough, and I happen to agree with him there. P.S. : I should mention that this book was a Christmas gift from Jenny a few years ago. Thanks, Jenny! As you can see, I enjoyed it. It took me a while to get through it because I kept starting, putting it aside, coming back to it weeks later, and finding that I had forgotten much of the material from the earlier lessons. Finally, this past summer, I committed to lesson every week or two and found it smooth sailing. I believe the trick was to wait until I was no longer either taking Greek classes or preparing to move. This entry was posted in Nonfiction, Poetry. Bookmark the permalink. I loved this when I read and worked through it a while back- just the right balance of information and humour (I especially liked Fry’s comments about sprung rythym) . Very brave of you to share one of your poetry exercises! Sarah, You’re right–it’s the perfect blend of learning and laughing. And as scary as it was, I felt I had to show the results of Fry’s tutelage. This book sounds great! I’m not all that interested in writing poetry, but I like studying it a lot, and I enjoy reading books that are about the craft of poetry. And the writing exercises sound like a lot of fun. Your description of Fry’s thoughts about form and free verse remind me of Nicholson Baker’s novel The Anthologist, where the narrator, a poet, is putting together an anthology of rhyming poetry. He makes many impassioned arguments for poetic form in the novel. I think you might like it! Dorothy: I’ve seen The Anthologist reviewed several times and might have even added it to my list (it’s on my mental list anyway). And I do think this would be enjoyable even if you don’t want to write poetry, just because he explains poets’ techniques so well. I am a big fan of Stephen Fry and all he does – not that I’ve read this one (poetry is NOT my forte), but I love his approach because he’s so witty and wise. And bravo to your verse, Teresa! I enjoyed it. litlove: I’m sad to say, I mostly know Stephen Fry as Jeeves, although I have managed to find a few episodes of QI online. And I’m glad you liked my verse–I had to hold my breath and close my eyes as I hit post! This does sound fun! 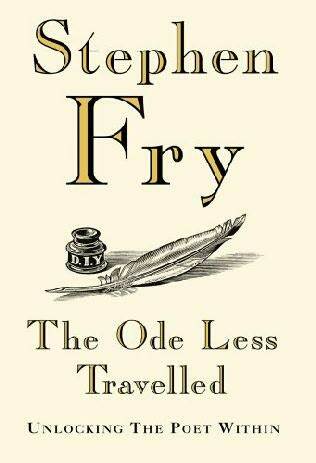 I adore Stephen Fry – the same cannot be said for poetry, which is why I haven’t picked this up yet. However, it doesn’t sound remotely as intimidating as I’d somehow built it up to be in my mind, so I might have to check this out one day. Claire, this isn’t intimidating at all! Quite the opposite. I’m not sure how much you’d like it if you don’t like poetry, but then again Fry’s wit might give you an appreciation for the art. Jenny, I still haven’t seen Wilde–must get around to it someday. My affection for Fry goes back to watching him with Hugh Laurie in Jeeves and Wooster when I was in college. I had no idea that there was embarrassment tied with the admission that you write poems. Might have to do with hanging out with a lot of poets, haha (thanks, Creative Writing degree). Sasha: I think people just don’t talk about poetry as a fun hobby the way playing the piano or knitting might be. Most people I know who write poetry are trying to get it published, and that’s not Fry’s interest, which is I think what keeps him from being intimidating. I fear I might have worn out my own poetry-writing muscles with Fry’s exercises, but you never know, inspiration may come again! Stefanie: Great! I hope you do enjoy it when you have the time to devote to it. Jenny, I’m glad you gave it to me! Even if I never go so far as to write another couplet, I think just knowing a bit more about these poetic techniques and forms will help me appreciate poetry that I read more. Oh, Teresa, this sounds like so much fun. I saw this weeks ago when you posted about it but I didn’t read it them. And, while I am not a poet in any sense of the word, the more I read about it, the more I want to be able to write it! I love poetry! Thanks for this post. and I LOVE your poem. It’s great. I have just picked this book up second hand and consider it one of my best finds. Stephen Fry clearly could have been an inspirational English teacher – poetry and language has never been so interesting and funny. it really is laugh-out-loud in places. A poetry book!! Hope he has more work like this to come.